Well I am 2 months into my year-long goal. This is a quilt I made for a dear friend’s granddaughter. Originally it was going to be a baby shower gift. The good news is that is was done in enough time for her 1st birthday. The pattern is The Hoots!™ by Amy Bradley Designs©. I love the simplicity of this applique and that the owls are so whimsical. Normally, I like to do invisible machine applique, but I am from the school that one should not use monofilament thread for a baby’s or small child’s quilt. I decided to do machine embroidery applique with a satin stitch. If you have a machine that embroiders and you have not tried applique, I suggest you give it a go; it is really a lot of fun. 1st step was digitizing the applique design in my software. I use Bernina’s embroidery software, Designer Plus 6. This software makes digitizing applique as easy as pie; unless you can’t make pie in which case it’s pretty easy. I had fun matching the colors and making sure no owl was duplicated; not sure that really matters, but sometimes I get myself locked into designing. I don’t always recommend this approach, it can really slow me down. The construction of the quilt itself was very straight forward with not a lot of seams to match. The cornerstones (little squares of color) are floating so even if your seams aren’t spot on, it will not show. Good qualities in a pattern for beginners. I started the quilting by stitching in all the ditches. I highly suggest using a top stitch sole on your walking foot for ditch stitching. (note to self: blog about stitching in the ditch) This method is not as easy as it looks and yet it is the one that everyone suggest to all beginners. Stitching outside the ditch is just as effective and less stressful. I used polyester batting, not my favorite but again this is for a wee little person. The blocks themselves needed to be quilted, but I didn’t want to take away from the owls. I stitched as close as I could around the outside of each owl and then on the inside of the white eye sections. 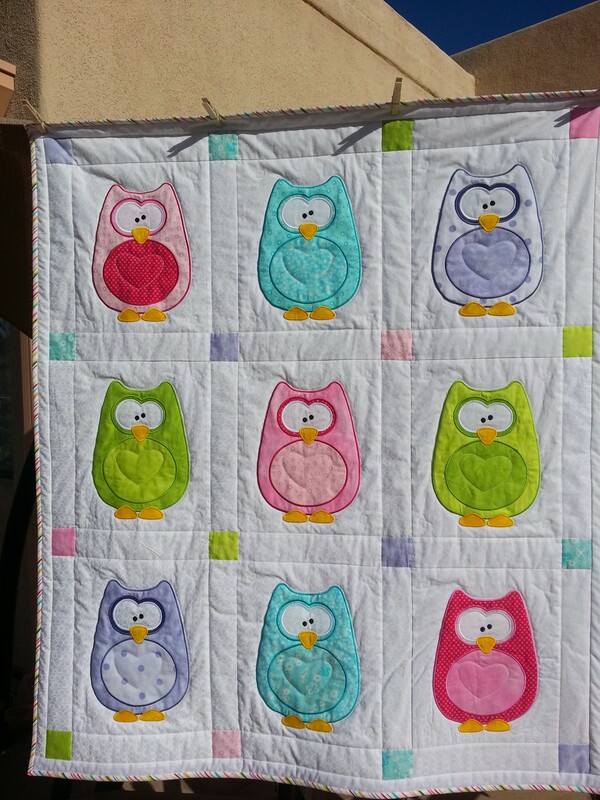 Still needing more quilting, I put hearts in the owl’s bellies and little hearts up in the corners of the blocks. It was important to me that the quilting did not take away from the owls and stayed as much as it could in the background. I also wanted the quilt to stay soft and fluffy. Knowing I could not stitch perfect hearts, I digitized them too and quilted them with my embroidery machine. Striped binding cut on the bias and it was done. The quilt made it to the birthday party actually wrapped. PHEW, another successful month.